The Crimson Lake Trail Run is a fun event for runners of all ages! There is a 3 km event for families, a 10 km event and a 20 km event for long-distance runners. 2016 marks the 22nd year for the annual trail run at Crimson Lake Provincial Park. This annual event is aimed at offering a fun event for runners of all ages and abilities, promoting an active lifestyle, and an appreciation of our natural spaces. It’s a non-profit event, and any funds raised go toward the maintenance and development of the trail system at Crimson Lake. The trail run is set for the third Saturday of August every year. 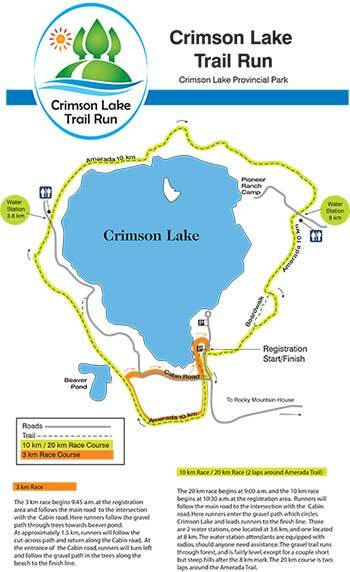 We encourage runners of all ages to join us for a fun trail run at beautiful Crimson Lake.